Egypt has been classified as “water scarce” since 2005, though water scarcity has seriously curtailed the country’s capacity for adequate domestic production of basic food staples dating back to the 1970s. The Blue Nile, which begins in Ethiopia, contributes about 85 percent of the water flow that passes through Egypt. Construction of the Grand Ethiopian Renaissance Dam (GERD) in upstream Ethiopia thus poses a great threat to Egypt’s water resources. The GERD construction, which commenced immediately following Egypt’s 2011 political uprising, was inadequately addressed by Egyptian political leadership despite its potentially grave implications. In the years it takes to fill the reservoir, the water needed to meet the basic needs of up to half a million Egyptians could be evaporated. Furthermore, GERD threatens to curtail agricultural expansion, damage water stations, collapse canals and drains, cause environmental destabilization, cut access to electricity, and cause extreme flooding. Since its 2011 uprising, Egypt has faced heightened political, security, and economic risks—ranging from a failed state on its western borders (Libya), rising domestic militancy and terrorism, severe fiscal and foreign exchange crises, and dwindling water resources. Problematically, Egyptian leadership has had difficulty executing decisions to effectively mitigate these risks, especially decisions that bear on national security. The absence of an evidence-based national security decision-making process raises questions about Egyptian policymakers’ understanding of the concept of “national security,” and their capacity to address the issues that worsen the security situation and prevent economic recovery. One of the issues in which this dilemma is most clearly illustrated is also one that is vital for Egypt’s well-being as a state: its water and food security. The failure to address threats to its water and food security is also a direct threat to the normative functions of the Egyptian state. While Egyptian policymakers understand that boosting Egypt’s economic growth and stability would greatly improve Egypt’s regional and international position—and thus its national security—in actuality, they tend to focus their attention on preserving the state and its interests from internal extremism or external aggression. Preoccupied with thoughts of turning back aggression, Egyptian national security policymakers can only offer a failed, unfocused response to the Ethiopian government’s decision to start building the Grand Ethiopian Renaissance Dam (GERD)—a project that would most likely affect Egypt’s share and flow of Nile waters, and thus constitute a major threat to Egypt’s already endangered water and food security. 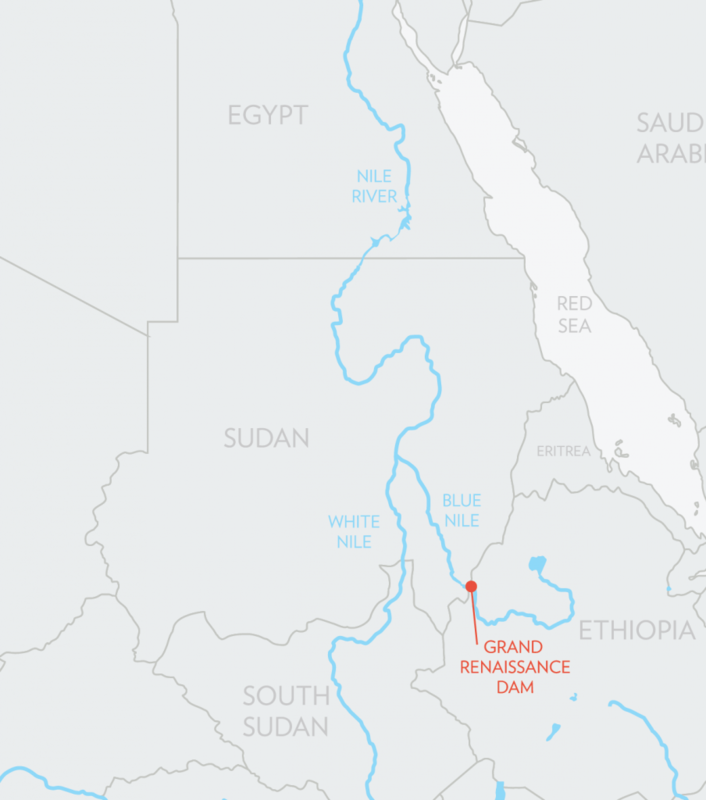 This report examines the Grand Ethiopian Renaissance Dam, and argues that Egyptian policymakers’ failure to appreciate its importance and its potential impact on Egypt are emblematic of their flawed approach to national security. This report also recommends that Egypt make water resource policy a much greater priority. Egyptians are fond of saying that their country is the “gift of the Nile.” Egypt is a hyper-arid desert ecosystem that experiences less than eighty millimeters of rainfall a year. In the 1960s, the Nile could meet the irrigation needs for growing enough wheat to feed Egypt’s population of 26 million on the mere 3.5 percent of its land that is naturally arable.1 Today, Egypt is the world’s leading wheat importer (accounting for nearly 10 percent of world demand).2 A mushrooming population, in the absence of judicious land-use regulation and decades of ineffective water governance, has led to the reckless exploitation of the country’s most precious resource. Water scarcity is a key factor in many of Egypt’s social ills, such as high food prices, wide economic disparities; as such, water and food security must be a vital component in the country’s national security strategy. Egypt has been classified as “water scarce”3 since 2005, though water scarcity has seriously curtailed the country’s capacity for adequate domestic production of basic food staples dating back to the 1970s. In the 1970s, among the factors that led Egypt to shift its foreign policy orientation from East to West was the failure of the Soviet Union to supply Egypt with wheat on preferential trade terms. Egyptian President Anwar Sadat understood that social instability might result in the event of disruptions to the supply of wheat. This made water security a matter of national security to the Egyptian state, because food security in Egypt has been and continues to be threatened by limited water resources. Perhaps the greatest threat facing Egypt’s water resources today are infrastructural developments in upstream riparian nations, such as Ethiopia. The Blue Nile, which begins in Ethiopia, contributes about 85 percent of the water flow that passes through Egypt to the Mediterranean. Egypt’s annual Nile water share is around 60 billion cubic meters. Agriculture uses around 85 percent of that water. Irrigation canals have opened dry desert areas of Egypt to agriculture. Source: Flickr. When the Ethiopian government started planning to build a dam and surveyed the potential site in 2009 and 2010, the Egyptian government under Hosni Mubarak stated that their objective would be to dismantle any threat that would undermine Egypt’s water security.12 According to WikiLeaks, Egyptian diplomatic sources stated that the “Sudanese President Omar Al Bashir has agreed to allow the Egyptians to build a small airbase in Kusti to accommodate Egyptian commandos who might be sent to Ethiopia to destroy water facilities on the Blue Nile. This will be Egypt’s option if all their other attempts fail to resolve the issue.”13 In March 2011, the Ethiopian government made the Grand Ethiopian Renaissance Dam project public—the timing was right after the Egyptian uprising, which led to the toppling of Hosni Mubarak, and consequently, the absence of Egypt’s political leadership. Throughout Egypt’s ill-fated transition, policy on the issue remained notable by its absence. More alarmingly, when the issue did arise publicly it was in the context of an ill-conceived meeting called by President Morsi in which various Egyptian politicians were seen suggesting an attack on the Grand Ethiopian Renaissance Dam (while unaware that their meeting was being aired live on Egyptian television). Once completed, the GERD will be Africa’s largest hydropower dam, standing some 170m tall. Moreover, if the GERD collapses, “an area of 16–20 square km stretching from the site of the dam all the way to Khartoum, Sudan would be impacted; a huge influx of water would pour into Lake Nasser, as well—if the lake was already full, this would most likely lead to the collapse of the High Dam in southern Egypt, given that there is currently no mechanism of draining excess water from the lake.”18 This worst-case scenario (but plausible, due to technical issues and climate change19) would destroy all of the cities in the “vicinity of the dam and extending to Cairo, flooding the delta.”20 This kind of information is readily available and the fact that Egyptian policy on the issue did not evolve is either reflective of a lack of proper due diligence or reckless neglect. This failure implies a serious dysfunction in the machinery of foreign policy making and its effects on national security matters. In his book The Philosophy of the Revolution, Gamal Abdel Nasser described Egyptian foreign policy as a three dimensional policy, meaning that the three circles Egypt’s foreign policy needed to address were: the Arab world, the African continent, and the Islamic countries.21 Nasser’s successors, Anwar Sadat and Hosni Mubarak, determined a new course for Egyptian foreign policy by lifting Egypt’s relations with the West to new strategic heights and allocating fewer diplomatic resources to the African continent. The 1995 assassination attempt survived by Mubarak in the Ethiopian capital, Addis Ababa, led the former president to disengage diplomatically from the rest of Africa, especially Ethiopia. Mubarak’s pivot confirmed a foreign policy shift that his predecessor, Anwar Sadat, had made toward the United States, Europe, and close Arab allies, further weakening ties and contacts with vital upstream riparians like Ethiopia. The damage to Egypt’s relations with African countries caused by this shift demonstrates that Egyptian foreign policymaking lacks anchoring in a core national security strategy that prioritizes the country’s water security as a matter of national security. The shift also exposes a structural problem in the Egyptian foreign policy establishment: the absence of institutional checks—such as an effective parliamentary foreign policy committee—against an individual leader’s inclinations, leaving vital national interests solely dependent on the presidency and its assessment of priorities, and thus national security matters. The latter complicated and undermined the possibility of productive bilateral negotiations, situating the Egyptian negotiator in collective negotiations, in which talks became more difficult due to a conflict of interest of each state. The slow pace of negotiations fueled Ethiopian impatience and likely contributed to Ethiopia’s decision to begin the construction of the dam. Egyptian policymakers ignored the Ethiopians and their right to seek their own national interests for decades, and instead accused Israel of instigating conflict at Egypt’s backdoor. Egyptian policymakers perceive Israel’s current support of Ethiopia’s mega-development program as Israeli collusion with the Ethiopian government to undermine Egyptian water security.25 This attitude is driven by the refusal of Egyptian policymakers to recognize Ethiopia’s legitimate and serious need for infrastructure development in accordance with Ethiopian national interests. In other words, the GERD project has constituted a major challenge for Egyptian diplomacy, exposing the weakness of the Egyptian state in general and the national security decision-making process in particular. The definitional fluidity of “national security” leads us to recognize the need for updating its meaning in line with shifting national circumstances and interests. This is to say, that if policymakers do not adapt their concept of national security to suit the changing threats and opportunities, they will fail to identify the state’s interests in a refined fashion. This is the case in Egypt, where policymakers struggle to update their perceptions of national security, and thus fail to set national objectives, formulate national strategic concepts, and allocate national resources to secure the state’s national interests in a way that adequately addresses today’s shifting political landscape. The Egyptian National Security Council was reestablished in accordance with Article 205 in Egypt’s constitution of 2014.27 Unfortunately, this reconstituted council has struggled to establish itself as a key body in the national security decision-making process. In Egypt’s case, the foundation of the state’s self-assessment of its capabilities and interests is often based on the notion of conspiracy—there is a mutual belief promoted by policymakers that any act that leads to instability within the country is undertaken by a foreign power or the Muslim Brotherhood, the Islamic political organization which was removed from power by the military in July 2013. The notion that this conspiracy is that a strong Egypt would threaten foreign powers’ interests in the region, and, therefore, the Muslim Brotherhood is being instigated and equipped by these powers to destabilize Egypt. For example, the Egyptian ambassador to the United States released a public letter to the New York Times accusing the newspaper of “unquestioning adoption of [Muslim] Brotherhood’s propaganda” and an absolute misunderstanding of the group and its terroristic nature. While the New York Times is obviously not a governmental entity, it is often perceived by Egyptian officials as indicative of American governmental interests and attitudes. Another common conspiracy theory is that Israel continuously plots to destabilize the Egyptian state. For instance, Mohamed Abdel Fadil Shousha, the former regional governor of South Sinai, claimed that “what is being said about the Mossad throwing the deadly shark in the sea to hit tourism in Egypt is not out of the question. But it needs time to confirm.”28 These conspiratorial allegations are certainly problematic and raise concerns that the very foundations of policy-making are based upon illusions. It is now crucial for Egyptian policymakers to develop a different approach to the GERD project and the potential negative consequences it entails for Egypt, one that consists of both a domestic component and an international component. Domestically, Egypt must formulate and implement a water resources management approach that can match the limited freshwater supply with increasing demand. The status of water in Egypt will depend on the available water resources, water demand, and institutional and legislative frameworks of water management.29 Egyptian policymakers must learn from the successful examples of other water-scarce countries. It is now crucial for Egyptian policymakers to develop a different approach to the GERD project and the potential negative consequences it entails for Egypt, one that consists of both a domestic component and an international component. Ironically, Egypt’s neighbor Israel is a pioneer in developing water-efficient systems, surpassing every other competitor’s ability to get “more crop per drop.”30 Israel is one of the only countries in the world that has created such an efficient infrastructure of water supply and conversion that it can now function without rain—the country recycles a big percentage of its own water, invented drip irrigation, and is the world leader in desalination.31 More than 50 percent of the water for Israeli households, agriculture and industry is artificially produced.32Israel’s knowledge in water resource management has been sought out by delegations from water scarce countries who visit Israel to become familiar with best practices and ways of adopting them back in their countries. Egyptian policymakers must engage in a similar constructive learning process with any knowledgeable entities that have the capacity to help Egypt to maximize its water efficiency, including Israel and despite the obvious domestic political sensitivities. Aquaculture in Kibbutz Ketura in the Negev Desert, Israel. Source: Wikipedia. Moreover, the United States’ interest in the stability of Egypt and Ethiopia makes the United States a potentially useful interlocutor between the two countries. As a result, inviting the United States or any other engaged party to assist the Nile riparians in reaching a fair, equitable agreement on joint operation of the Aswan High Dam and the GERD based on global best practices and experience might be an ideal solution to the issue, but faces serious challenges. Without a well-developed, carefully designed operating agreement, there is an increasing risk of conflict due to misunderstanding and ambiguity surrounding different motives and actions. In order to address water scarcity in Egypt as well as other issues surrounding the country’s national security-decision making process, policymakers must first engage in a national self-assessment of Egypt’s capabilities—which will only happen if policymakers engage in a process that filters out fiction from fact. The GERD case study reflects Egypt’s flawed approach to matters relevant to national security. The nation’s failure to adequately address relations with Ethiopia head on could now have dire implications for the Egyptian people’s livelihoods: GERD may negatively affect Egypt’s already limited water share, which would threaten food and water security as well as agricultural prosperity. Preventing this damage and avoiding the repetition of past mistakes requires an update in the methodology of Egyptian policymakers’ national security understanding. Rebecca Collard, “Luxury is produced in Egypt, but it is not for local consumption,” The Guardian, March 6, 2012, accessed May 9, 2016, http://www.theguardian.com/society/2012/mar/06/egypt-mubarak-farming-food-security. Lester R. Brown, “When the Nile Runs Dry,” New York Times, June 2, 2011, accessed May 15, 2016, http://www.nytimes.com/2011/06/02/opinion/02Brown.html. Ahmed Ibrahim Ramzi, and Alaa El-Nahry, “GIS DATABASE FOR RIVER NILE – 19th International Water …” (paper presented at the Fourteenth International Water Technology Conference, Cairo, Egypt, 2010), http://iwtc.info/2010_pdf/09-02.pdf. J. Allan, Virtual Water: Tackling the Threat to Our Planet’s Most Precious Resource (London: I.B. Tauris, 2011), 256. “Minister: Egypt Imports 40% of Its Food,” Egypt Independent, June 8, 2010, http://www.masress.com/en/almasryalyoumen/47715. Marwa Hussein, “UN warns of global food crisis, but is Egypt prepared?,” Ahram Online, September 10, 2012, March 12, 2016, http://english.ahram.org.eg/NewsContent/3/12/52150/Business/Economy/UN-warns-of-global-food-crisis,-but-is-Egypt-prepa.aspx. Ayman M. Hassan, Ali Abu El Magd, and Ahmed El Sanhoury. “Smart Metering for Domestic Water Flow – Challenges and …” (paper published October 20, 2014), https://www.researchgate.net/profile/Ayman_M_Hassan/publication/279059915_Smart_Metering_for_Domestic_Water_FlowChallenges_and_Resolutions/links/55894da308ae2affe71415fc.pdf?inViewer=true&disableCoverPage=true&origin=publication_detail. Water Challenges Forcing a Rethink on Usage,” IRIN, October 18, 2011, accessed May 8, 2016, http://www.irinnews.org/news/2011/10/18/water-challenges-forcing-rethink-usage. A. Swain, “Mission Not Yet Accomplished: Managing Water Resources in the Nile River Basin,” Journal of International Affairs 61.2 (2008): 201. Tom Burgis, “The Great Land Rush: The Billionaire’s Farm in Ethiopia,” Investing in Land in Ethiopia, March 1, 2016, accessed April 4, 2016, https://ig.ft.com/sites/land-rush-investment/ethiopia/. Frederick Kaufman, “The Man Who Stole the Nile.” Harper’s Magazine, July 2014, accessed March 13, 2016, http://harpers.org/archive/2014/07/the-man-who-stole-the-nile/. Nizar Manek, “Water Politics along the Nile,” Le Monde Diplomatique, May 9, 2014, accessed March 29, 2016, http://mondediplo.com/2014/05/09egypt. The Global Intelligence Files, accessed May 18, 2016, https://wikileaks.org/gifiles/docs/21/211372_re-egypt-source-.html. Ahmed Abbas, “Ethiopia Close to Finishing 70% of Grand Ethiopian Renaissance Dam,” Daily News Egypt, May 28, 2016, accessed June 13, 2016, http://www.dailynewsegypt.com/2016/05/28/ethiopia-close-to-finishing-70-of-grand-ethiopian-renaissance-dam/. “Will Ethiopia’s Grand Renaissance Dam Dry the Nile in Egypt?” BBC News, accessed March 13, 2016, http://www.bbc.com/news/world-africa-26679225. “The Grand Ethiopian Renaissance Dam Fact Sheet,” International Rivers, January 2014, accessed March 13, 2016, https://www.internationalrivers.org/resources/the-grand-ethiopian-renaissance-dam-fact-sheet-8213. Randa El. Bedawy, “Water Resources Management: Alarming Crisis for Egypt,” Journal of Management and Sustainability JMS 4, no. 3 (2014). doi:10.5539/jms.v4n3p108. Bruce Keith, Kevin Epp, Michael Houghton, Jonathan Lee, and Robert Mayville, “Water As a Conflict Driver: Estimating The Effects Of …” Center for Nation Reconstruction and Capacity Development, August 2014, accessed May 6, 2016, http://www.usma.edu/cnrcd/CNRCD_Library/Water Security.pdf. Gamal Abdel Nasser, The Philosophy of the Revolution (Buffalo: Smith, Keynes & Marshall, 1959). Yehia Ghanem, “The Nile Basin Initiative and The Crisis of Collective Negotiations,” Huffington Post, February 19, 2016, accessed March 13, 2016, http://www.huffingtonpost.com/yehia-ghanem/the-nile-basin-initiative_b_9280810.html. Abdel Monem Said Aly, “National Threat Perceptions in the Middle East,” UNIDIR, September 1995, accessed March 13, 2016, http://www.unidir.org/files/publications/pdfs/national-threat-perceptions-in-the-middle-east-235.pdf. Yossi Alpher. Periphery: Israel’s Search for Middle East Allies. Lanham, Maryland: Rowman & Littlefield, 2015. Ahmed Soliman. “سد النهضة الأثيوبي .. ومستقبل الأمن القومي المصري.” Www.alukah.net. 2013. Accessed April 18, 2016. http://www.alukah.net/culture/0/55477/. Ahmed Eleiba , “Egypt National Security Council awaits presidential green light,” Ahramonline, March 28, 2013, accessed May 11, 2016, http://english.ahram.org.eg/NewsContentP/1/67948/Egypt/Egypt-National-Security-Council-awaits-presidentia.aspx. Ryan Mauro, “Egypt Says NY Times Promoting Muslim Brotherhood Agitprop,” ClarionProject.org, June 3, 2015, accessed May 05, 2016, http://www.clarionproject.org/analysis/egypt-says-ny-times-promoting-muslim-brotherhood-agitprop. David Shamah, “India Minister Praises Israel’s ‘more Crop per Drop’ Farm Model,” The Times of Israel, April 2015, accessed June 13, 2016, http://www.timesofisrael.com/india-minister-praises-israels-more-crop-per-drop-farm-model/. Emily Harris, “Israel Bringing Its Years Of Desalination Experience To California,” NPR, June 14, 2015, accessed March 13, 2016, http://www.npr.org/sections/parallels/2015/06/14/413981435/israel-bringing-its-years-of-desalination-experience-to-california.israel. Isabel Kershner, “Aided by the Sea, Israel Overcomes an Old Foe: Drought,” New York Times, May 29, 2015, accessed February 13, 2016, http://www.nytimes.com/2015/05/30/world/middleeast/water-revolution-in-israel-overcomes-any-threat-of-drought.html?_r=0. Omar Nasef is a foreign policy associate at The Century Foundation, focusing on the geopolitics of the Middle East and international security.